Shimelle's new class, Scrapbook Remix, is in full swing, and in typical Shimelle fashion, it is full of inspiration! Each week there are five prompts with four layouts for inspiration with eight new videos along the way. If that isn't enough, Shimelle has also provided "extras" in the form of Extended Play and Spot Your Style handouts, links to other videos that are relevant to the prompt (Glitter Girl episodes, etc), and a gallery on the forums where we can be inspired by everyone else's work. The idea behind the class is learning how to mix patterned paper from one collection with papers from other collections. In all honesty, that part of the material is completely lost on me since I rarely keep up with the manufacturer of a product and never purchase kits or collections of paper. However, the material is written so that we all learn how to mix and match different patterned papers - and that is definitely fun and inspiring! Prompt One started us off with four ideas for layouts, the first one being to use one color of paper in multiple tones to create a monochromatic layout. I decided it was time to scrap about our Laundry Room Remodel, so I started with one full sheet of patterned paper and my yellow scraps. 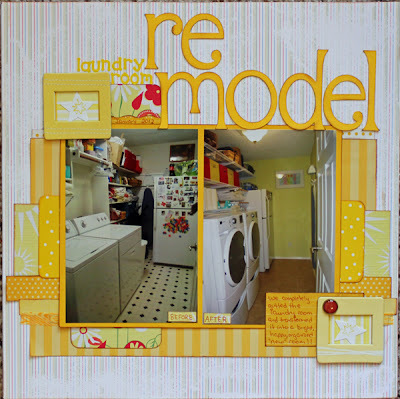 I mounted my photos on yellow cardstock, then pulled several patterned papers from my stash to create this layout based on Shimelle's example. Since she suggested using a small amount of one additional color, I allowed a small amount of red to show in one patterned paper and added a red brad to create a trio of red pops of color. 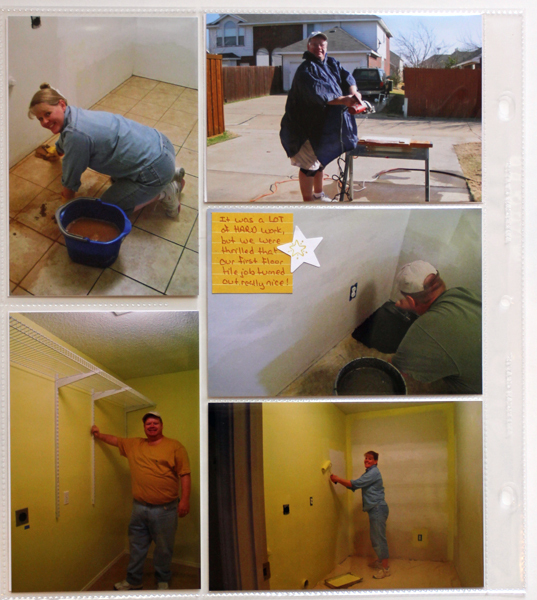 I only used one before and one after shot for this layout, but I had a lot of photos of the process that I wanted to include in my album as well. 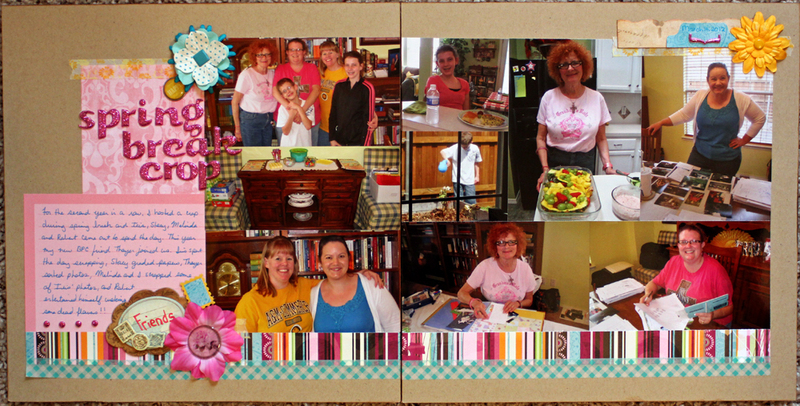 I chose a 10x12 divided page protector (both sides) to showcase the additional photos, adding in a few paper strips and embellishents to coordinate with the layout. I consider these pages together to be a three-page layout with twelve photos, and I really like how together they tell the story of our remodel while still allowing me to use lots of patterned paper scraps. Welcome to the final day of Not-My-Typical-12x12 Week here at Daily Life - Bits & Pieces. 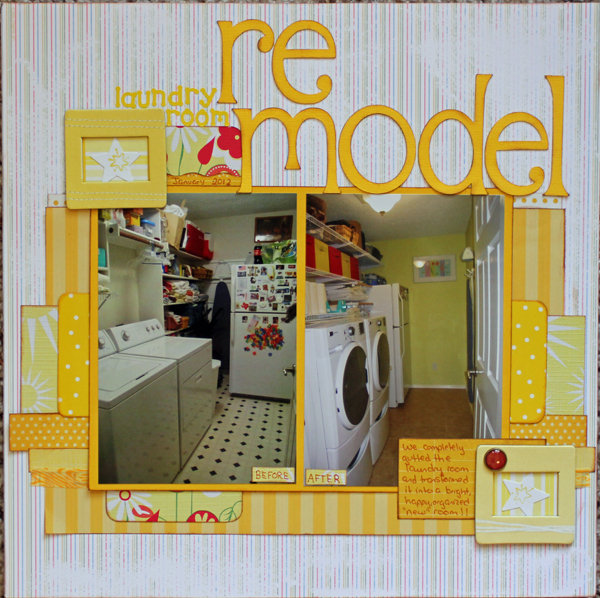 Each day this week I've shared a layout that is not my traditional 12x12 layout. 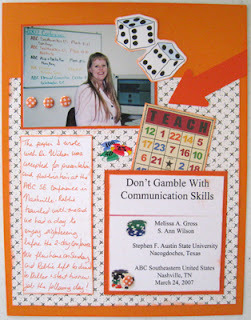 These layouts have been various sizes and formats. One thing to keep in mind when using a divided page protector is what you will include on the opposite side. For the back of the page protector that I used in yesterday's layout, I chose photos and memorabilia from our day at the Texas State Fair in 2007. Journaling reads: A nice Saturday at the fair with friends. 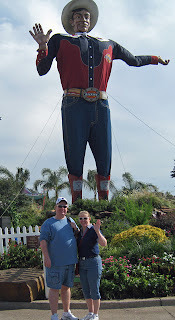 We watched the dog show, toured the movie costume exhibit at the Women's Museum, ate chocolate-covered strawberries, and rode the Texas Star. The journaling on the dog bone at the bottom left reads: We caught the dog show just as we entered the fairgrounds - amazing what dogs can be trained to do. Thanks so much for joining me for Not-My-Typical-12x12 Week. If you found some inspiration to create different size layouts, use divided page protectors, or add cross-referencing to your albums, please let me know in the comments. Today's layout uses a divided page protector, this one a 12x12 with four 6x4 slots and one 12x4 slot, and once again uses Shimelle's cross-referencing concept. These photos document our first trip abroad together, an 18-day trip that took us to Russia, Italy and the UK. (Some of you may remember the inauspicious beginning to that trip recorded here.) 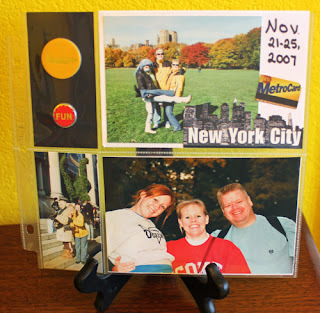 When we returned, I created a huge block of 12x12 pages for our Travels Abroad album, however I wanted to include a snapshot of that trip in our 2007 album. 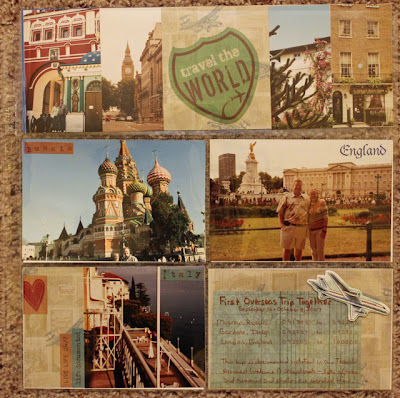 The journaling box lists the dates we were in each country and then the journaling reads: This trip is documented in detail in our Travels Abroad (Volume 1) scrapbook - lots of notes and memories and photos are recorded there! Just for the record, there is not yet a Travel Abroad Volume 2, however Volume 1 is full and I'm optimistic that we'll travel abroad again in the near future. The divided page protector helped this layout come together very quickly. Do you use these types of pages protectors in your albums? 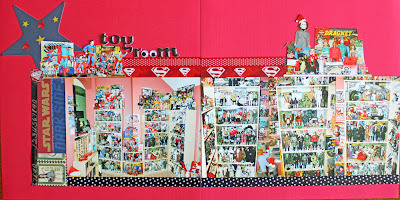 I have another 8 1/2 x 11 layout to share today, this one is actually 2 pages that are stored back to back in my 2007 album. 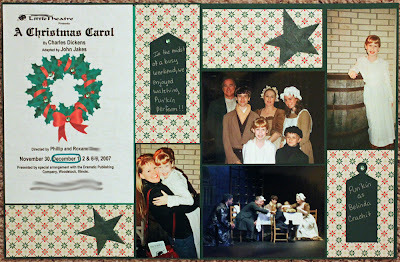 These pages showcase another performance by Pun'kin Natashia, this time as Belinda Crachit in A Christmas Carol. Once again I used the program as my title block. 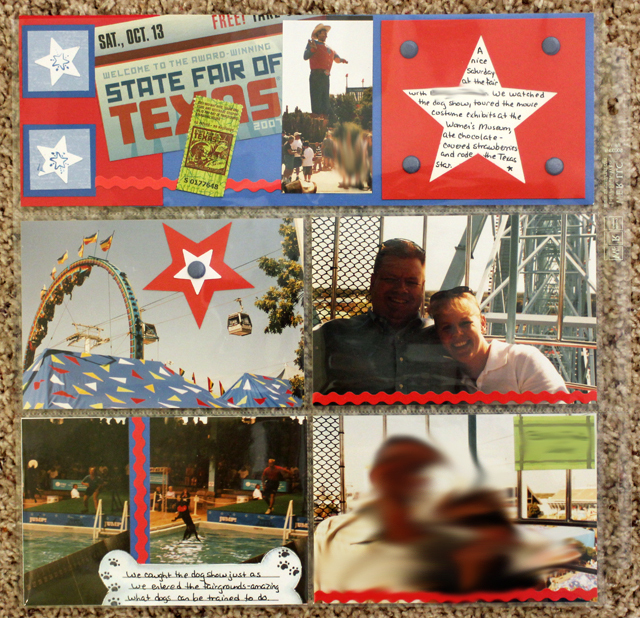 I placed my photos on the pages, then filled in the gaps with patterned paper and added tags and stars to complete it. I am actually planning some time with my nieces in week or so and am looking forward to taking lots of photos for future layouts! 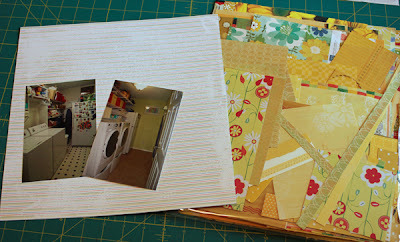 I have another 8x8 layout to share today, however this one uses both sides of a divided page protector. We spent five days of Thanksgiving week in New York City in 2007. 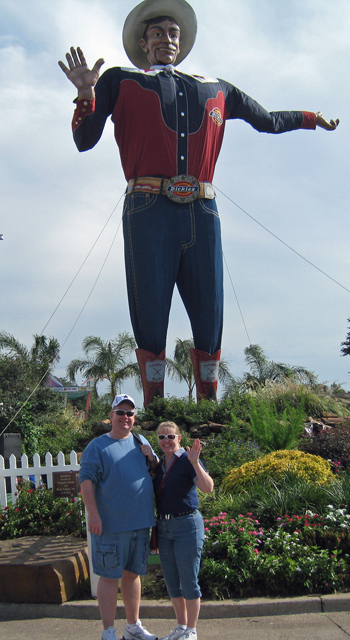 This trip was a high school graduation gift for my oldest niece. 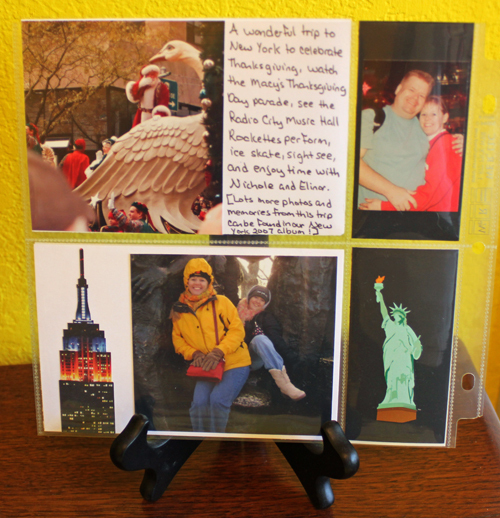 My friend Elinor, who loved New York, also traveled with us. After the trip, I created two nearly identical 12x12 albums with photos from the trip - one for me and one for my niece. So, for my 2007 album, I simply wanted to add a small page showcasing a few photos. I used a divided page protector with two 4x6 spaces and two smaller spaces. 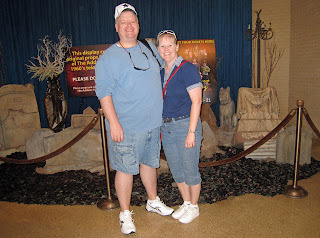 Welcome to Not-My-Typical-12x12 Week here at Daily Life - Bits & Pieces. Each day this week I'll be sharing a layout that is not my traditional 12x12 layout. These layouts will be various sizes and formats. The six layouts I'll be sharing do have one thing in common - they all showcase photos/stories/memories from 2007. 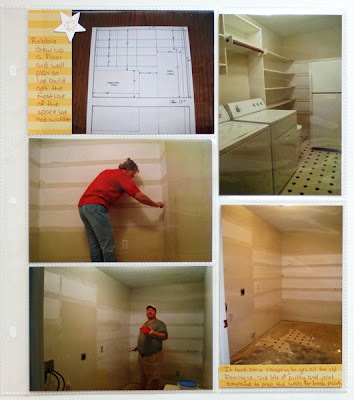 I decided it was time to clean out the remaining photos from my 2007 storage binder, and with these completed layouts I'm almost there (just a few more to go). 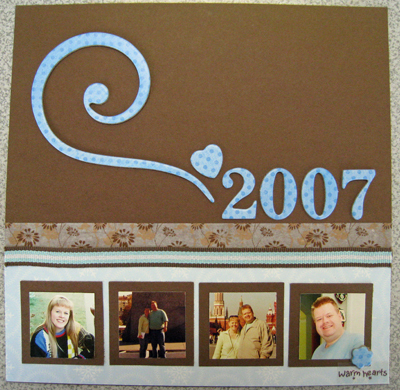 This first layout is 8x8 in size and will be the introduction page in my 2007 album. Yes, that's right, I have a chronological album for 2007. This is a little change from the Library of Memories system and my Category Albums. After giving it a lot of thought and taking Shimelle's Cover to Cover class, I have made some adjustments/ updates to how and where I store my layouts. However, that's a post for another day . . . so back to my 8x8 layout. I like the simplicity of this layout with matted square punched photos, a strip of ribbon, a strip of washi tape, and some chipboard numbers and accents.The reason I chose to do a 8x8 layout for this introduction page is very simple - the second layout in the album (the one that will go in the page protector behind this one) is an 8x8 that I created some time back. Do you have an album (or albums) for each year? Or do you store your layouts by category? Or a combination of both? I enjoyed the second Crafty Tuesday at Ellyn's, where I worked on the journals for our ladies' retreat. 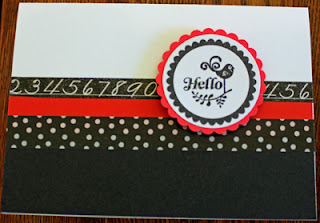 I thought it was such a great idea to add tabs to these altered composition books . . . but by the time I adhered the final one (140 total tabs! ), I was questioning my sanity. Luckily, one of the ladies from church volunteered to come over the next week and add the cover logo and adhered a schedule and 3 additional notes pages inside the journals. 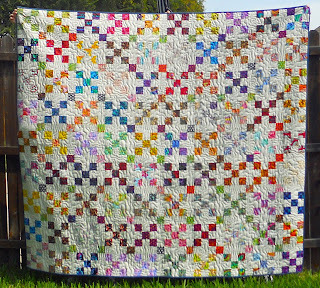 Ellyn is a dear friend and wonderful quilter - she finished the binding on this beautiful quilt that day! 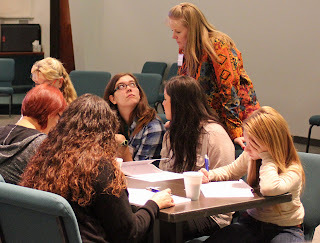 Of course, the big event this month was the ladies' retreat at our church that I've spent the past few months working on. The retreat went very smoothly and we have already received great feedback on the teaching and curriculum that I wrote (it was truly a message from the Lord, He just let me share it!). 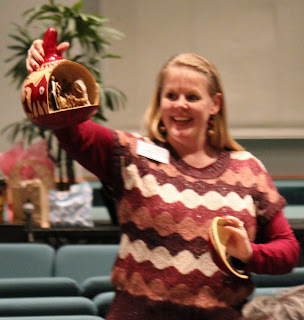 I spent the weekend teaching (notice the cute baskets in the photo below - filled with crafty goodies to make cards for our final session on Friday evening) . . .
and handing out door prizes (like this beautiful nativity my friend Becky brought from Kenya) . . .
and encouraging the ladies to use those journals . . .
and answering questions . . .
and occasionally not getting it quite right! I had put together a neat illustration using a photo of our church. 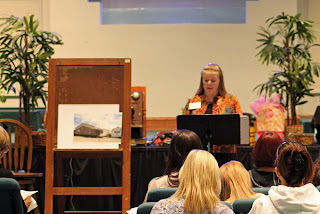 I cut the church building up into pieces and each lady added her name & spiritual gift to one piece. 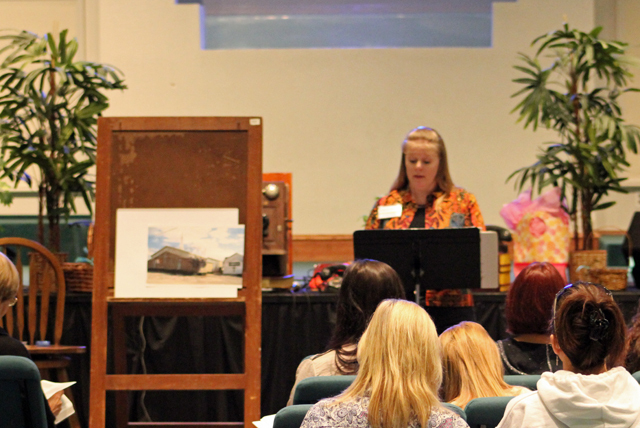 I then put the pieces together to reveal the picture of our church. I had additional pieces surrounding the church (the sky, parking lot, youth building, etc) to add during my teaching session to represent the rest of our church, community, nation and world. However, I forgot to put my original pieces to the left of the page and ended up with my photo hanging off the edge of my background paper! I was honored that my Mama came to the Friday evening portion of the retreat - this is only the second time she's ever heard me teach. The title of the retreat was God Is Calling You, and we had set up an area as a "photo booth" for participants to take fun photos. 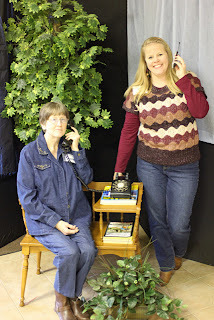 I love this photo of me and Mama and the telephones I borrowed from my parents for the event. 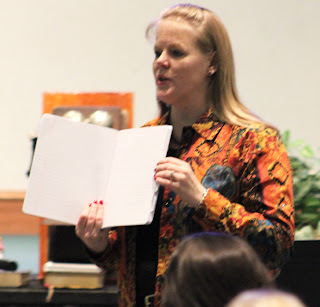 My friend Becky arrived back in the states earlier in the week (she and her husband Don are missionaries in Kenya, East Africa - check out my latest post on their blog here), and she spoke and shared examples of how God called them into missions. I so appreciated her helping me out despite the fact that she had not even had time to adjust to the time difference and was still battling jet lag. 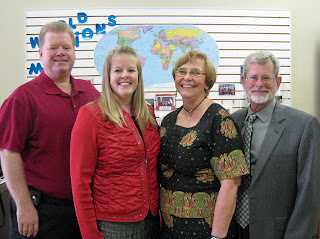 She and Don also joined us at church on Sunday where Don shared about the work they are doing in Kenya. The biggest blessing of the weekend for me was the fact that Robbie was there. 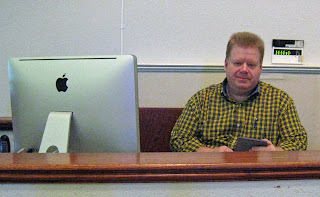 I needed someone to run the sound and video, so Robbie spent the entire time there helping. 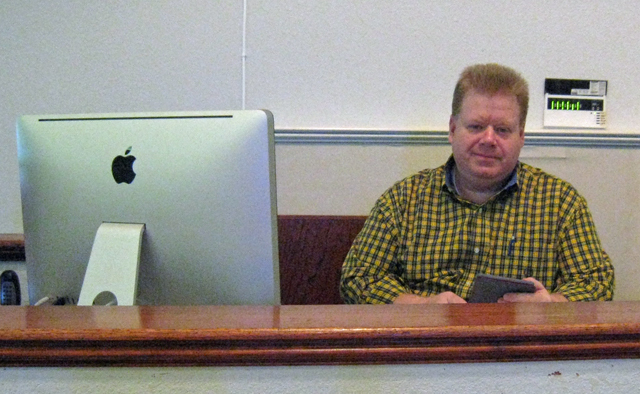 He said it was the best women's retreat he's ever been to (of course, it's the only one, too! LOL). 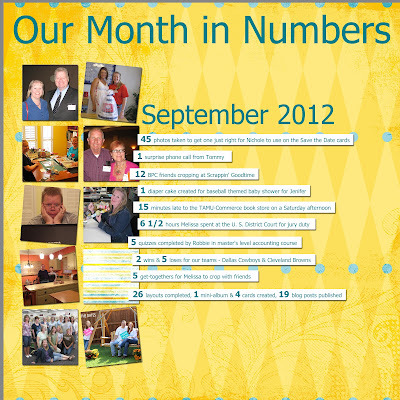 Surprisingly, we've also had time for a fun things this month. Robbie and I attended a nice luncheon for Brother Bill's Helping Hand. We found a Xodiac colorform alien (just like the one Robbie got for Christmas when he was five-years-old) at the DFW G.I. 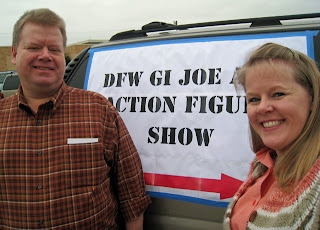 Joe and Action Figure Show. If you've made it through this long post (or scrolled down to see what's in store! 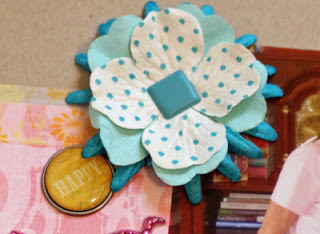 ), I have a fun week planned here at Daily Life - Bits & Pieces. 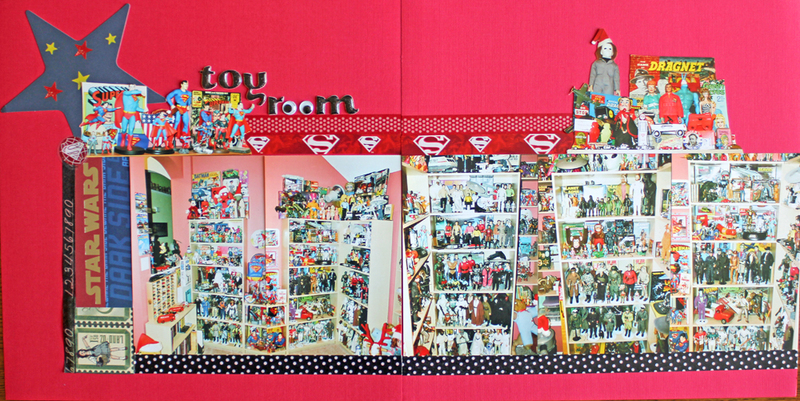 First, let me say a huge thanks to all of you who commented that you were inspired during my Double-Page Layout Week. While I primarily create traditional 12x12 layouts (one or two page), I occasionally create other sizes or use divided page protectors. I like the way these layouts add variety and interest to my albums. This week I'll be sharing a variety of layouts in different sizes (8x8, 8 1/2 x 11, 12x12) and formats (divided page protectors, double-sided). 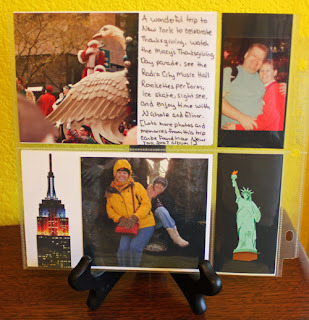 So be sure to check back each day or some Not-My-Typical-12x12 inspiration! I'm trying to get everything updated on the Pass the Book: Year Two page, and I need your help. If you currently have a book or have recently passed one, please check the list below for accuracy and then please leave a comment verifying the information or letting me know if I need to make updates! Also, if you're still hoping for a chance to read one of these books, be sure to check the updated page in a few days so you can watch for it to be passed! 1. 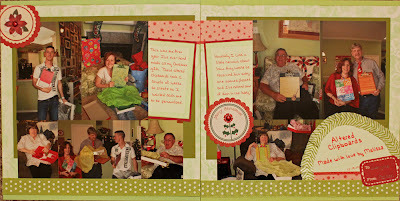 (Aug 2011) Sharing Your Story was returned to me by Deb of Deb's World. Thank you!! 4. (Nov 2011) Scrapbooking Your Faith is with Valerie of Adventures with Valerie. 5. (Dec 2011) The Girls From Ames (new book) is with Missus Wookie of Missus Wookie's Wanderings and she is ready to pass it on. Click here for a chance to be the next recipient. 6. (Jan 2012) The Writing Life is with Ginger of Ginger's Life of Spice. 7. (Feb 2012) The Artist Unique is with Monica of Quest to Perfect Imperfection and will soon be on its way to Beverly of Be Glorious. 8. 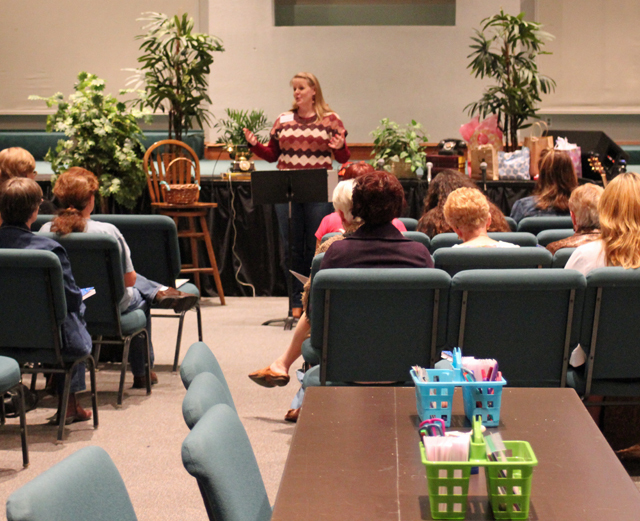 (March 2012) Sabbath is with Beverly of Be Glorious and she is ready to pass it on. Click here for a chance to be the next recipient. 9. 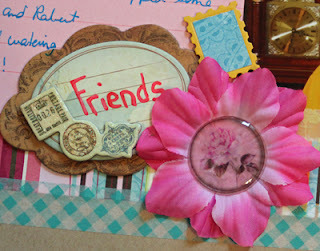 (April 2012) Creative Stamping for Scrapbookers is with Alison of Life in the Slow Lane. 10. (May 2012) Lifted is with Alison of Life in the Slow Lane and will soon be on its way to Jemma of Just Jimjams. 11. (June 2012) Art Journaling (Winter 2011) is on its way to Cheri of Scrap Dreams. 12. 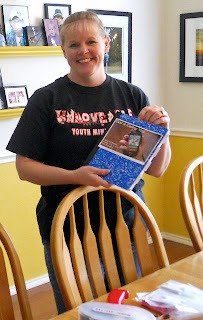 (July 2012) Trading Card Treasures is with Elizabeth of Journaling by Lizzie and she is ready to pass it on. Click here for a chance to be the next recipient. Today is the final installment in double page layout week here at Daily Life - Bits & Pieces, where each day I've shared a two page layout inspired by a sketch from the BPC Double Take workshop I took last fall. 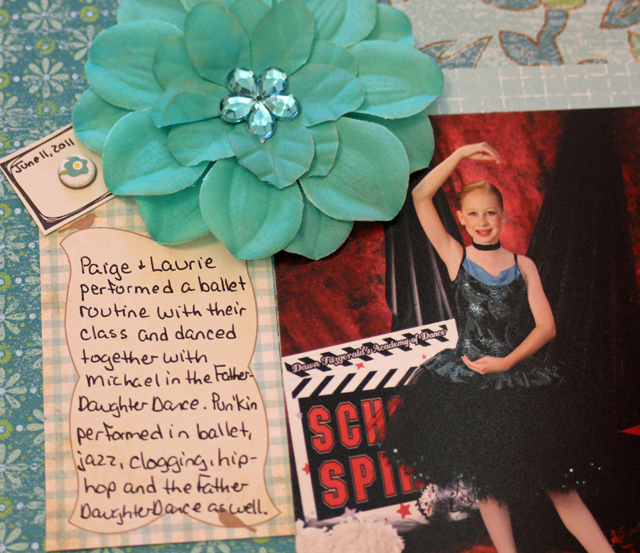 I pulled out the sketches and several batches of photos recently and created all new layouts inspired by the sketches. 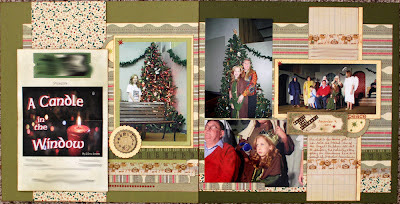 I chose photos from earlier this year for today's layout. I especially like how this sketch allowed me to use quite a few photos and still left room for a good bit of journaling. The sketch also had room for three embellishment clusters. There were so many colors in these photos that I chose a variety of colorful items for these clusters. 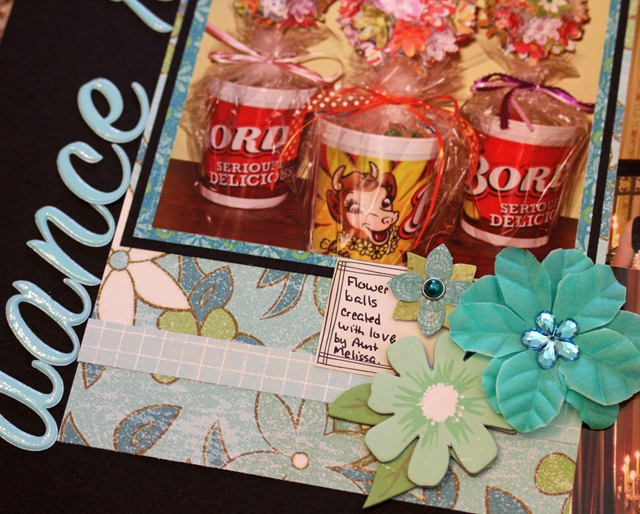 Thank you for joining me for Double Page Layout Week! I have enjoyed your comments and will probably do another double page layout week in a month or so when I've completed layouts with the remaining Double Take sketches. 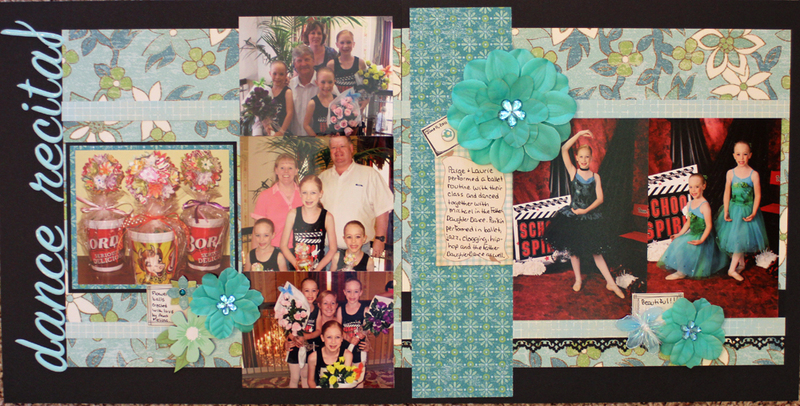 Have you been inspired to create any double page layouts this week? 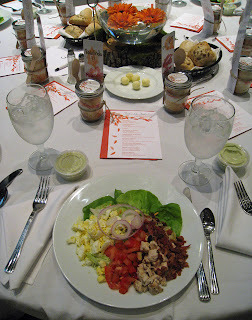 BTW - Remember that ladies' retreat I've mentioned a few times? The one I've written the teaching and entire curriculum for? Well, it's finally arrived - today and tomorrow I'll be busy setting up, speaking, teaching, coordinating, eating, visiting with the ladies from our church, organizing, instructing, cleaning up, etc. (Of course, I have a team of ladies helping me, too!!) So if you haven't seen any comments from me this week on your blog, it's because I've had a busy week of preparations - but I'll be around next week to catch up. And don't worry that I might be having withdrawals without any crafty time because I wrote in a session on card making as a service project that we'll be completing during the retreat. :>) We'll be making cards for Pastor Appreciation Month, Card Cupids, and Operation Write Home. This week is double page layout week here at Daily Life - Bits & Pieces, and each day I am sharing a two page layout inspired by a sketch from the BPC Double Take workshop I took last fall. I pulled out the sketches and several batches of photos recently and created all new layouts inspired by the sketches. Most of the time, I choose a double page layout because I have quite a few photos I want to use, however the sketch I used for today's layout only called for four photos (2 portrait & 2 landscape). I chose photos from a play that Pun'kin Natashia performed in last fall. I included the program instead of a title and embellishment cluster on the left page. Natashia did a fantastic job in her role as Mable, one of the (angel) children all set to perform the nativity story play on Christmas Eve to a group of stranded travelers. I like the way this sketch offered plenty of room for me to include the program. Do you include this type of memorabilia on your layouts? Some of you may remember the altered clipboards I made as Christmas gifts a few years ago. I pulled these photos from my 2010 storage binder and set to work. 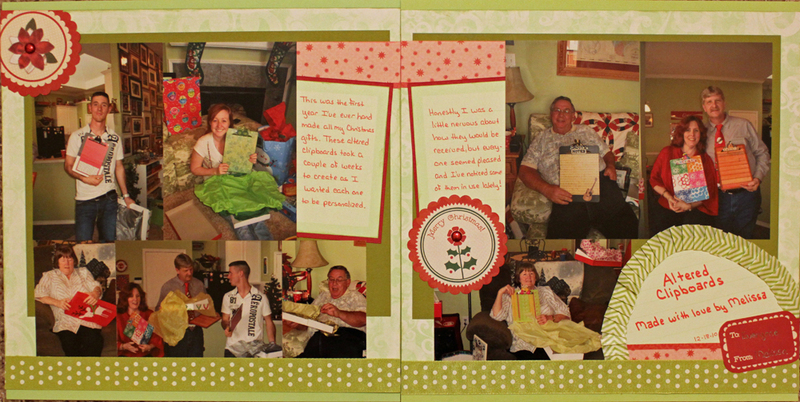 Journaling reads: This was the first year I've ever hand made all my Christmas gifts. 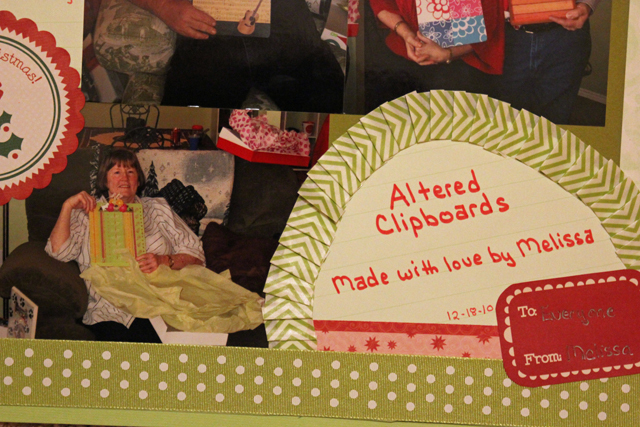 These altered clipboards took a couple of weeks to create as I wanted each one to be personalized. Honestly I was a little nervous about how they would be received, but everyone seemed pleased and I've noticed some of them in use lately! As you can see, I am still enjoying my new found addiction to washi tape! 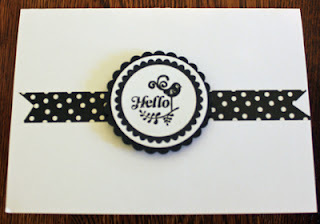 I pleated the green chevron patterned washi tape to create a rounded border for my title block. What have you used your washi tape for lately? The sketch for today's layout called for five portrait oriented photos, and I knew the photos we had taken in Robbie's collectible room would work perfect. 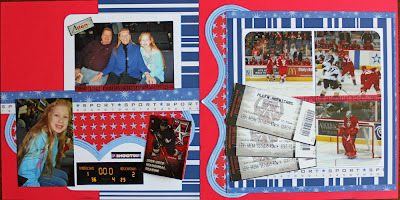 The photos for today's layout are from Pun'kin's Natashia's visit in 2010 when we attended a local ice hockey game. 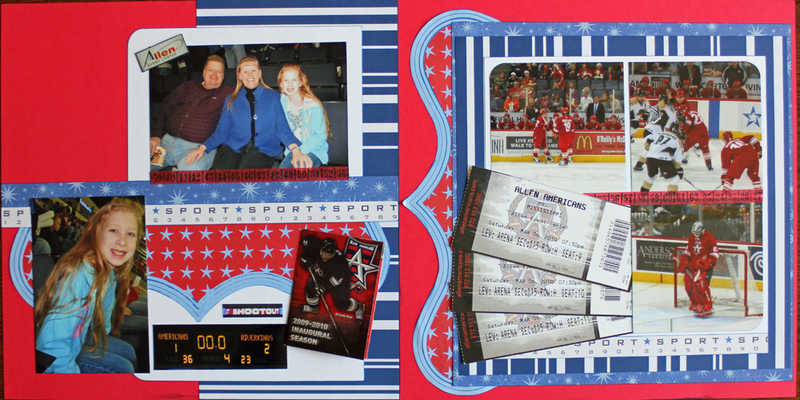 I included our ticket stubs in the place of one of the photos on the right page and a small game brochure on the left page in lieu of a large title block. 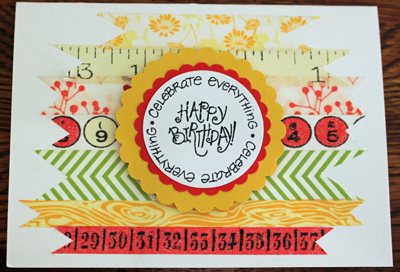 I especially like the way the die cut paper works on both sides of this layout. 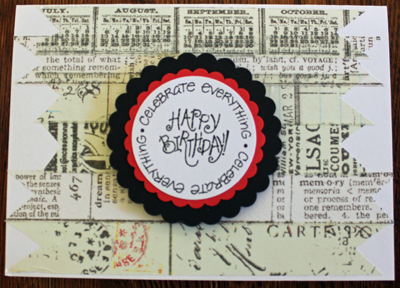 Have you created any two page layouts lately? Did you start with a sketch or a batch of photos or something else as inspiration? This month Sian proposed the theme of Let's Dress Up for Storytelling Sunday, the "first-Sunday-of-the-month gathering of storytellers, tale spinners, journalers and memory keepers" over at From High In The Sky. Over the past few weeks, I've been going back through the sketches from the BPC Double Take workshop that I took last fall. I have a ton of photos in my storage binders and knew that creating some double page layouts would help me clear some space for a huge batch of new photos I ordered recently. 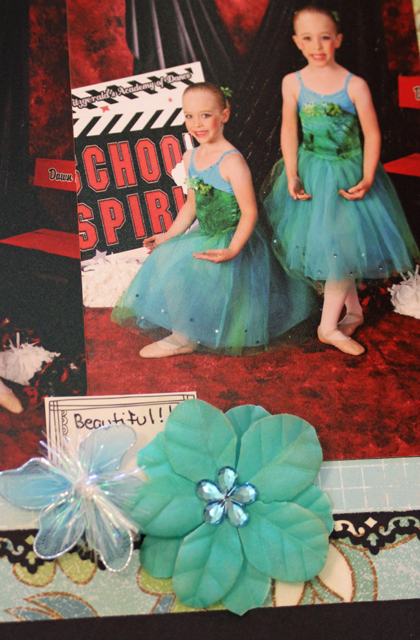 And it just so happens that I have a double page layout with my nieces all dressed up in their dance recital costumes to share with you today. Robbie and I made the five and a half hour drive down the day of the recital and arrived at the theatre in time to snap some photos before the recital started. I had made flower balls for the girls and stuck them in cups filled with candy. The girls were absolutely beautiful in their outfits and they each performed wonderfully that evening. My sister sent us their professional photos a few weeks later, and I love the way this sketch allowed me to combine my photos & these beautiful shots into a double page spread. 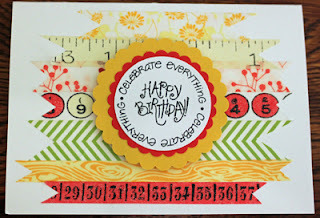 I'm declaring this week here at Daily Life - Bits & Pieces to be double page layout week, and each day I'll be sharing a new layout inspired by the Double Take sketches. So be sure to check back in this week for some double page inspiration. For today, hop on over to Sian's blog and check out more October stories. Jackson: The Iron-Willed Commander is the first book I've read in The Generals Series. This series of books is about leaders who stood out above the rest and includes books on Grant, Lee, MacArthur, Patton, Pershing, Sherman, and Washington. This book chronicles the life of the 7th president of the United States, Andrew Jackson. I received this book free from BookSneeze in exchange for an honest review. I chose this book because I'm always trying to challenge myself to read more history since that is one subject I don't naturally gravitate toward. I enjoyed learning more about the life of Andrew Jackson, from his early years to how he continued his education after being orphaned as a teenager to his rather determined decision making that led to him becoming an American military hero and eventually president of the United States. However, I have to admit that the book read more like a textbook than an interesting account of his life, making it a slow read for me and I do not plan to read the other books in the series.